The discussion page of this article contains text that can be used to expand the article. Please rewrite it with an encyclopedic tone and incorporate it. Caleb Blood Smith (April 16, 1808 – January 7, 1864) was an American journalist and politician, serving in the Cabinet of Abraham Lincoln during the American Civil War. Born in Boston, Massachusetts, he emigrated with his parents to Ohio in 1814, was educated at Cincinnati College and Miami University, studied law in Cincinnati and in Connersville, Indiana, and was admitted to the bar in 1828. He began practice at the latter place, established and edited the Sentinel in 1832, served several terms in the Indiana legislature, and was in the United States Congress in 1843–1849, having been elected as a Whig. During his congressional career, he was one of the Mexican claims commissioners. He returned to the practice of law in 1850, residing in Cincinnati and subsequently in Indianapolis. He was influential in securing the nomination of Abraham Lincoln for the presidency at the Chicago Republican National Convention in 1860. Smith became a Freemason in Warren Lodge No. 15 at Connersville, Indiana in 1829. He would go on to serve as Grand Master of the Grand Lodge of Indiana in 1837. Today, the highest award presented by the Grand Lodge of Indiana is the Caleb B. Smith Medal of Honor. Lincoln appointed Smith as the United States Secretary of the Interior in 1861 as a reward for his work in the presidential campaign. He was the first citizen of Indiana to hold a Presidential Cabinet position. However, Smith had little interest in the job  and, with declining health, delegated most of his responsibilities to Assistant Secretary of the Interior John Palmer Usher. In 1862, he was interested in the empty seat in the United States Supreme Court vacated by John Archibald Campbell's resignation the previous year. However, Lincoln nominated David Davis for the position instead. 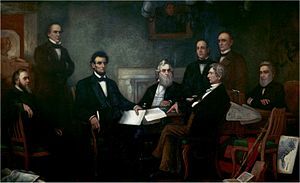 When Lincoln showed the draft of the Emancipation Proclamation to his cabinet, the conservative Smith considered resignation upon its public announcement, but accepted the decision in the end. After Smith resigned in December 1862 due to poor health, Usher became Secretary. Smith went home to become the United States circuit judge for Indiana. He died January 7, 1864, from his ill health. President Lincoln ordered that government buildings be draped in black for two weeks in a sign of mourning for Smith's death. It has been said that Caleb B. Smith's body is buried in a Connersville, Indiana cemetery. In 1978, Connersville resident John Walker received permission from the Smith family, Norvella Thomas Copes, and Nancy S. Hurley, and the city of Connersville to excavate the body of Caleb Blood Smith. Walker had an interest in President Abraham Lincoln, and discovered in reading about Lincoln that one of his cabinet members was buried in the city in which he lived. An excavation was done in November, but Smith's body was not there. It was Smith's brother-in-law William Watton Smith. C.B. Smith's wife, Elizabeth B. Watton, had paid $500 for the choice of plots, in Greenlawn Cemetery but had to remove the body to Crown Hill Cemetery in Indianapolis for fear of southern dissenters, the Sons of Liberty, desecrating his body and of local teens knocking over the markers. There was also a possibility that his body was in one of the two above ground vaults behind the Elmhurst house in Connersville, but both doors were standing open and had been for years, with nothing inside (also in Connersville, Indiana). A letter inquiring about the whereabouts of Smith's body found in the 1980s arose from a New York public library in the 1930s. ^ Smith, Dwight L. (1968). Goodly Heritage: One Hundred Fifty Years of Craft Freemasonry in Indiana. Franklin, Indiana. ^ The Cincinnati Historical Society Bulletin, Vol. 30. 1972. pp. 47. ^ Sanford, pp. 392-93. In 1890 the Greenlawn Cemetery was closed. "Caleb Blood Smith". Find a Grave. Retrieved 2009-03-26. "Caleb B. Smith Papers, 1849-1862, Collection Guide" (PDF). Indiana Historical Society. 2004-11-01. Retrieved 2012-11-02. "Weird Mystery" a story about Caleb Blood Smith, can be found at http://www.libraries.iub.edu by typing in the search bar. This is a story written by John Walker and co-written by Cynthia Long, John Walker's granddaughter. "Smith, Caleb Blood" . Appletons' Cyclopædia of American Biography. 1900. This page was last edited on 14 April 2019, at 07:34 (UTC).